So this is my 16x12 inch canvas I am finally able to post. There were glare issues on my part so I am happy to be able to show you this little Monika Brint design. I just had to paint it on a canvas. It was relatively quick and very friendly to say the least. I love friendly snowmen. You can't see in the picture here but the snowman with a greenish coat has a rusty bell hanging off his hat, the other snowmen have real wooden painted black buttons glued onto their coats. Another idea from my hubby JB to do that. He is a clever boy that one. Think I will keep him around as a craft consultant. And below is my latest finished eDition pattern from Kim Klassen's weekly pattern subscription. I worked on 2 of these today and loved how they turned out. I bought the wood at Home Depot and thought I was buying the right size according to the tags on the wood. I get home and I can't get my 2nd tree on the wood which is to the right of the house, there are supposed to be 2 trees but I could not manage to squeeze it in. Little did I know that when they sell wood it isn't necessarily the size that you are buying. I measured the width of my wood then I got home and I was missing 1/4 of an inch. To me that is a big difference. With some help from Kim Klassen she informed me of what she does and the measurements that she buys so hopefully this won't happen again. Anyways more things to paint and then I think I will stop painting either Thursday or Friday to do the fiddly stuff. I love it...great minds think alike!!! 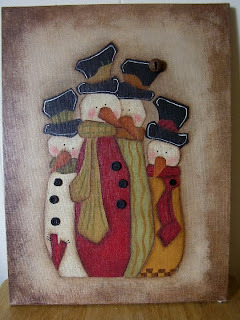 I just finished the snowman fireplace screen like in my blog header....which is of course Monika Brint snowmen. My husband just got done putting the hinges on....yeh! I'm proud of myself for getting it done in time for my show....it was a goal of mine. Did you paint the canvas with acrylics or oils? I like the Kim Klassen piece also... I've done that also..keep those brushes flying!!!! Les, you are sooooooo talented. I am so proud of you. I am quite sure that you are going to sell out at your sale. Luv, luv. You are a very talented artist. You do such neat pieces. Love your last couple posts. Keep the paint/brushes flying. Your kind comments help me to keep motivated. What adorable things! That snowman canvas is just too cute!